It is so great to see so many of our loyal customers and also plenty of new faces too! We really appreciate your support of our small local business – we realize that you do have choices. We hope that we are providing you with the excellent customer service that you have come to expect and that you are more than happy with your plants! Please tell your friends about us! Local economic stimulus: When you purchase at locally owned businesses rather than nationally owned ones, more money is kept in the community since locally owned businesses often purchase from other local businesses. Here at the farm, we use local companies for our printing, web design, t shirts, furnace maintenance, porta potty rental and newspaper advertising to name just a few. Purchasing locally helps grow other businesses as well as the local tax base. Non profits receive greater support: Local business owners donate more to local charities, fundraisers and events than non local owners. We are happy to support many organizations. Unique businesses create character and prosperity: The unique character of our local community is defined partly by the businesses that operate within it, which in turn plays a big part in our overall satisfaction with where we live and the value of our home and property. Most new jobs are created by local businesses: Small local businesses are the largest employers nationally. Plus the more jobs we have in our local community, the less people have to commute, meaning less traffic and pollution. We hope we will see you soon! 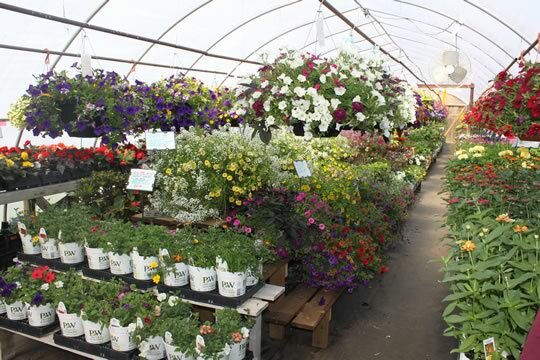 We have a wide selection of veggies and herbs, all kinds of hardy perennials and shrubs, beautiful hanging baskets and planters and a good choice of potted annuals. If you have taken advantage of our custom container planting service, your planters are ready to be picked up anytime! They look fabulous! If you enjoy this newsletter, please encourage your friends to sign up to receive their own copy. All e news contacts will be entered in a draw on June 1 to receive a $100 gift certificate for the farm. So pack up the kids / life partner / Mom / friend / neighbour and head on over! Enjoy our perennial display gardens or take a break under our shady canopy. Kids will love visiting with our pet rabbits and ducks and seeing our horses, cows and calves. See you soon! This bright and unusual annual is sure to turn some heads! If you enjoy a touch of the wild, then Campfire Burst may be for you! 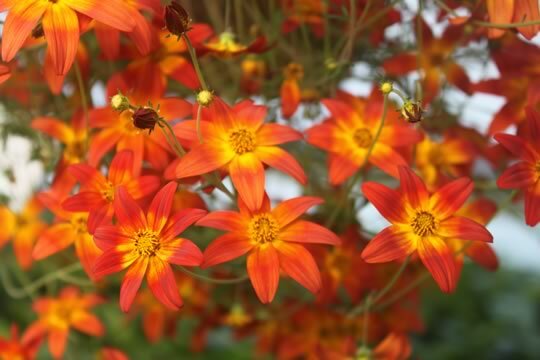 Bright and small, the russet red / orange flowers with yellow centres really pack a burst of colour. The effect is an airy and somewhat wild look. Previously only available in yellow, this new Bidens loves heat and full or partial sun. Combine with Supertunia Red, Euphorbia Diamond Frost or Bidens Goldilocks to create a whimsical and airy combination in bright, hot colours. This season, I was fortunate enough to be offered some sample trial seed from Ball Seed, one of the large seed companies that I buy from. The trial seed is for varieties that will be released for commercial sale in 2017. I selected 2 new cucumbers – Martini and Gherking to trial. Martini - Sweet and crunchy, this unusual white skinned slicing cucumber has a non bitter white interior. Fruit should be harvested at 5-6” length when the skin is tender and does not need peeling. Plants are very high yielding and perform well in heat. 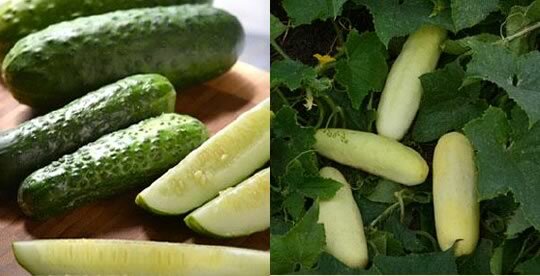 Gherking – A pickling cucumber which can be eaten fresh or pickled. Dark green gherkins are cylindrical and non bitter. For best results, harvest at 3-5” long. Gherking has excellent disease resistance and yields are early and large. Sound interesting? Try them out and let us know how these 2 brand new varieties worked for you! Bed preparation: Choose a sunny, flat location with well drained soil. Cut flowers require similar conditions to veggies. At least 8 hours of sun is ideal. Plants can be grown in their own dedicated garden or be interspersed in other perennial or shrub beds. If planting in a dedicated garden, rototill the soil in May and add organic matter such as compost or well rotted manure. Cover the ground with a fabric mulch. This will heat up the soil, promoting root growth, help prevent weed growth and hold moisture in the ground. 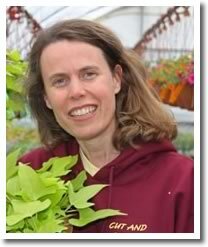 Planting: Cut holes in the groundcover and plant annual flowers after the last frost – typically early June in this area. Most varieties can be planted about a foot apart, but refer to tags for specific spacing. Water well after planting. Care: Fertilizer such as water soluble or organic pelleted types can be applied throughout the growing season. Most crops are not fussy and are not prone to pests or diseases. 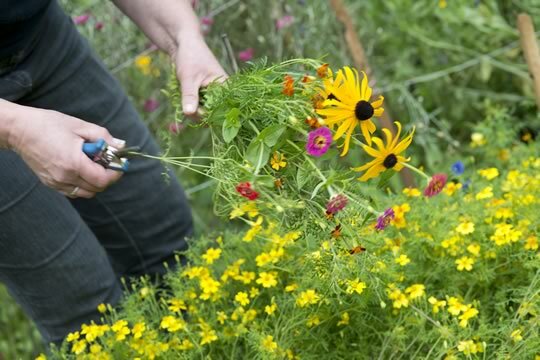 Harvest: Most varieties will require about a month of growing time before they can be selectively cut for bouquets. Harvest early in the morning, immediately put stems in water and cool in the house or barn. 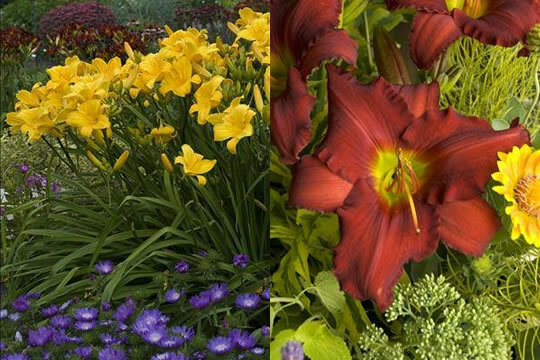 As flowers from your own garden will be so fresh, you can expect to enjoy blooms for a week or more. Flowers should keep blooming until the first frost hits in the fall. Red Razzmatazz – 32” tall. Large, fire engine red flowers with a yellow throat. Very vigorous. Buttered Popcorn – 32” tall. Large bright yellow fragrant flowers. Passionate Returns – 17” tall. Rosy red, ruffled flowers. Extremely floriferous. Stephanie Returns – 17” tall. Bicoloured peachy pink & rose purple ruffled flowers. Stella D’Oro – 15” tall. Bright gold, small flowers. Plant in large groups. You can be sure that any of these premium varieties will reward you with continuous colour all summer long. Just add sun! An Award Winning Summer Company! Our 16 year old son Daniel has big plans for the summer! He is starting his own summer business named Dan’s Garden to grow cut flowers to sell at local Farmers Markets. 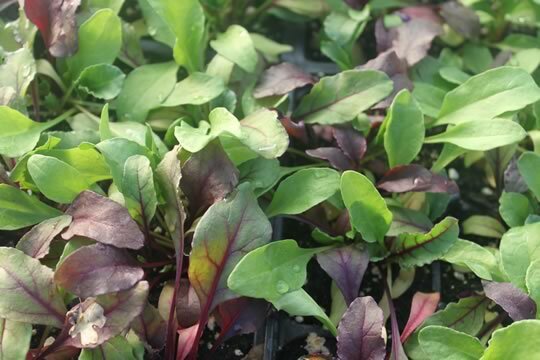 Through the winter and spring, he has been working on planning his business and growing the transplants in the greenhouses. Now he has started on the outdoor work – creating the garden and planting the crop. 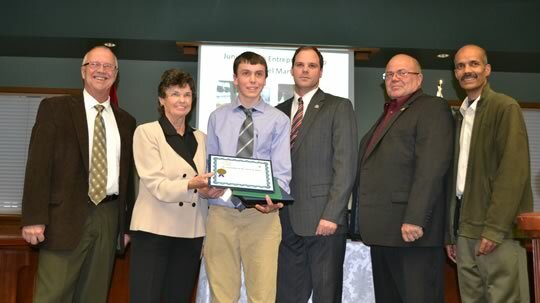 In April, he was awarded the Junior Youth Entrepreneur Award at the 2016 South Simcoe Business Excellence Awards for his efforts thus far. Dan’s Garden was judged on categories including quality, customer service, community involvement as well as his business plan. Daniel is planning to attend the Rosemont Farmers Market on Friday evenings and the Creemore Farmers Market on Saturday mornings to sell bouquets. Flowers should be ready early July onwards. Daniel can be reached by e mail at dansgarden2016@gmail.com and he appreciates the support of his local community in this venture. Pop one of our new annual Instant Garden Pots in a container or in the ground for instant colour that will last all summer! 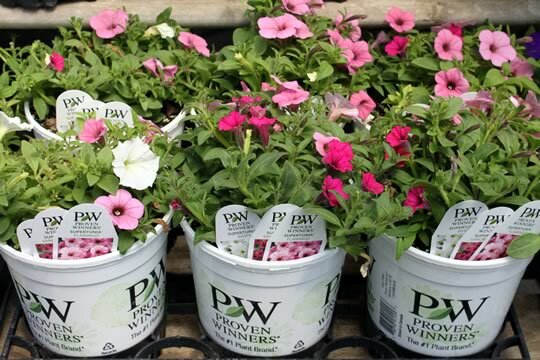 Each of our combo 1 gallon pots contains 3 colour coordinated premium Proven Winners varieties that will grow together successfully and spread to create beautiful blooms until frost. Choose from 10 different combos to suit all colour schemes. 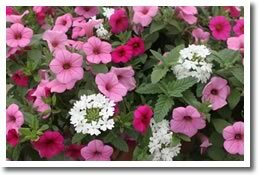 Pots may include Supertunias (spreading Petunias), Superbenas (spreading Verbenas), Bidens, Superbells and Euphorbia varieties. As with all other annuals, regular fertilizing is recommended. Designed to help simplify your life - another unique Flower Farm idea! Thank you for your continued business and support – It is our pleasure to be growing for you! See you soon at the farm or market.